Jennifer Razo was born and raised in Makawao on the island of Maui. She graduated from Kamehameha Schools Maui Campus in 2006 with a double endorsement in the Information Technology and the Arts & Communication Academies. 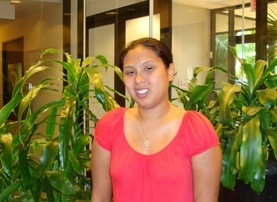 Jennifer is currently a junior enrolled in the Computing, Electronics, and Networking Technology (CENT) program, where her interest lies in Networking and Computer Security. Her goal is to graduate with a BS from the CENT program through UH West Oahu, complete her CCNA and A+ certifications, and go on to secure a position in industry. In every company or organization, people worry about their data getting into the wrong hands. In order to protect this information, large amounts of time, money and manpower are spent on system administration and security. This ensures that private information remains secure from outside parties, such as hackers intent on stealing social security or bank account numbers. To protect sensitive information at the Maui High Performance Computing Center, we compared the security features of three operating systems: Windows Vista, Windows XP, and CentOS. In order to evaluate their relative effectiveness at protecting data, we compared firewalls, administration tools, and overall security between the three systems. We discovered that the Linux operating system is more secure than the others because Linux users are not given administrator rights by default. Once the operating systems’ differences had been investigated, we configured two servers with Raid 10 disk formatting: four hard drives are used, and each pair is mirrored and striped with information. CentOS and RedHat Linux were each installed on one of the two servers. Afterward, both systems were patched with security updates. Currently, Linux System Administration is being investigated as a means to protect the information systems. In addition, we are investigating which services are necessary to run the system, which services are non-critical, and which changes in practices would better secure the system. Once the appropriate operating system has been identified to protect our servers, we can begin accurately securing our information.